Food is the star of any barbeque party. Planning a barbeque party can seem like a lot of work, but keeping things simple and well organized will make everything run smoothly. Barbeque parties are a great way to mingle with friends and family, enjoy some fresh air, and take advantage of seasonal foods cooked on the grill. Once these decisions are made, it's on to the rest of the planning. Invitations should be sent out, or guests called and invited, well before the date of the party. Since most barbeque parties take place in the summer time, you'll want to make sure you reach all of the guests between vacations and other commitments. If you've decided on a theme for the party, then the decorations will be easier to choose. If not, settle on a few colors and patterns which you'd like to use, and pick up simple decorations like fresh or potted flowers, balloons, and party lights. Coordinate the plates, cups, tablecloths, and napkins to match the colors of the decorations. You'll also want to make sure that there's plenty of seating available, including many spots in shaded areas to keep guests out of the bright sunlight for hours at a time. If you're planning a sit-down meal, you'll also need lots of big tables. Try renting these, or borrowing them from friends. Side dishes should be plentiful, and you can ask your guests to bring things like potato or pasta salads, green salads, corn on the cob, bread and rolls, baked beans, and fresh vegetables.Make sure that you have some foods to offer guests who are vegetarian, or suffer from food allergies. Drinks can range from bottled beer and wine, or bottled vodka-based coolers, to plenty of bottled water, sodas, and juices to suit every taste. Store the beverages in large buckets filled with ice or portable coolers located in several places around the party grounds. 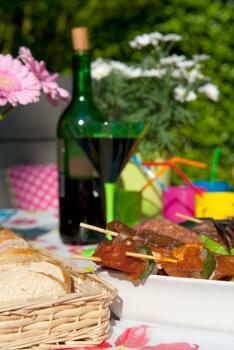 Most barbeque parties don't require any games or structured activities unless there will be lots of children present. If this is the case, plan a few games with prizes for the youngsters, or organize some outdoor sports like badminton or volleyball. Almost any party is better with music. Choose songs that are summery and remind people of the warm weather, or tunes that fit into your party theme. Stock up on as much ice as you can store. Ice will be used for drinks, to keep cold foods from spoiling, and to fill coolers. You'll likely never risk having too much on hand. The best part about hosting a barbeque party is that you can do most of the cooking and preparations outside amongst your guests. Enjoy the time spent outdoors together!